The two surviving members of The Beatles attended a film screening to remember their late bandmate George Harrison on Wednesday. Sir Paul McCartney and Ringo Starr joined Harrison's widow Olivia to watch footage of a concert held in memory of the guitarist last year. Sir Paul, who was accompanied by wife Heather, said: "Our feelings will never change for George - we loved the happy times and we're sad that George is gone." 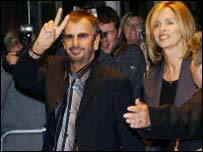 The screening was held to mark the cinema and DVD release of A Concert for George Harrison, filmed at London's Royal Albert Hall. The tribute concert included performances by Sir Paul and Starr as well as Tom Petty, Jeff Lynne, Billy Preston and members of Monty Python. Harrison died in Los Angeles in 2001 after losing his fight against cancer. The film will be given a limited cinema release from Friday and will be available on DVD from 17 November. Harrison's widow, Olivia, and son, Dhani, helped organise the tribute show. At the screening, Olivia said: "This is a gathering of George's close friends and family, so it's always going to be emotional. "This concert pays tribute to someone we all loved. I think he'd enjoy it." Meanwhile, Sir Paul was tricked by a radio presenter who called him on his mobile phone and pretended to be Canadian Prime Minister Jean Chretien, the Sun newspaper reported. 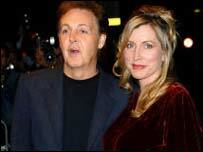 Montreal radio comedian Marc Audette, speaking English with a heavy French accent, told Sir Paul he was being awarded the Order of Canada, the newspaper said. The singer realised the call was a prank when he spotted Beatles lyrics dotted in the conversation, the paper added. "You Canadians are funny," McCartney reportedly said. "I was beginning to think Canada has one zany PM."